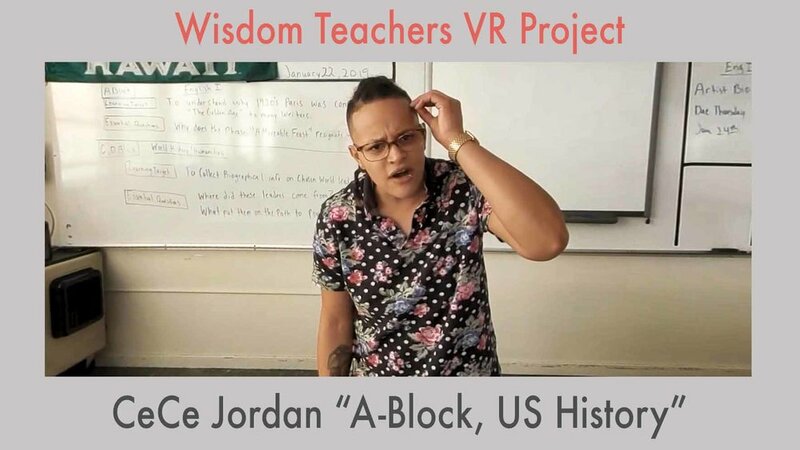 My highest goal for the Wisdom Teachers VR Project is to affect positive change in the world. With that in mind I’m always keeping my antennae tuned in to making that happen, so when my buddy (and great cinematographer/colorist) Jamie LeJeune told me about his friend Cassidy Friedman’s “Circles” project, I knew that something special was coming in. 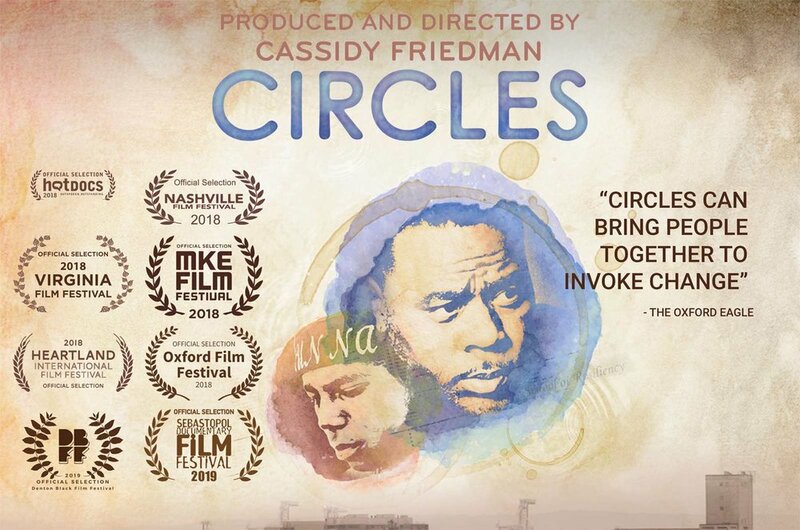 Circles is a feature documentary currently making the film festival circuit — it’s about restorative justice and particularly how teens can come together and heal each other with the help of facilitators in this subtle art. Specifically, the plot of Circles is that Eric Butler, a Hurricane Katrina survivor and pioneer of the restorative justice movement, relocates and finds work at an Oakland, California, high school. 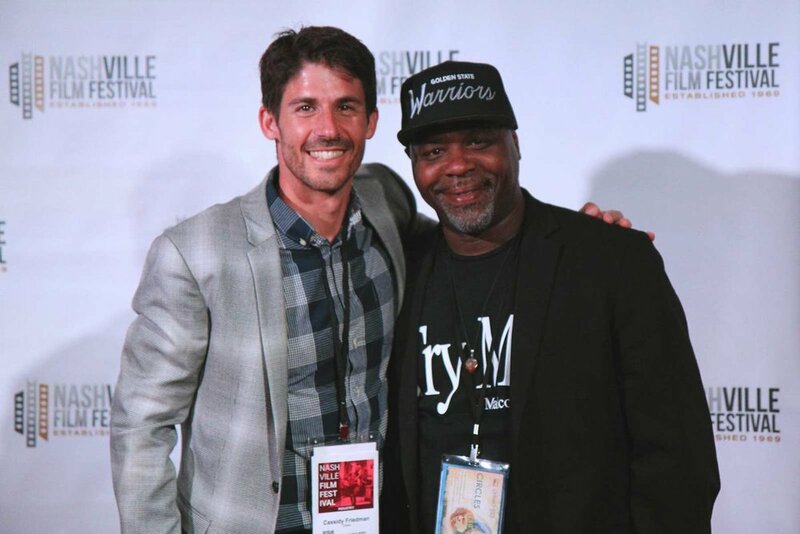 Shot over two years, the film follows Butler's tireless efforts to nurture troubled youth and keep them in school, fighting racial discrimination by replacing snap suspensions and expulsions with gritty, intimate and honest mentoring. But when his own teenage son is arrested and beaten in jail, he begins to question his methods and ability—not just as a teacher, but also as a father. With incredible access, Circles is an inspirational portrait of a father desperate to provide his son with the leadership and compassion he never received from his own. 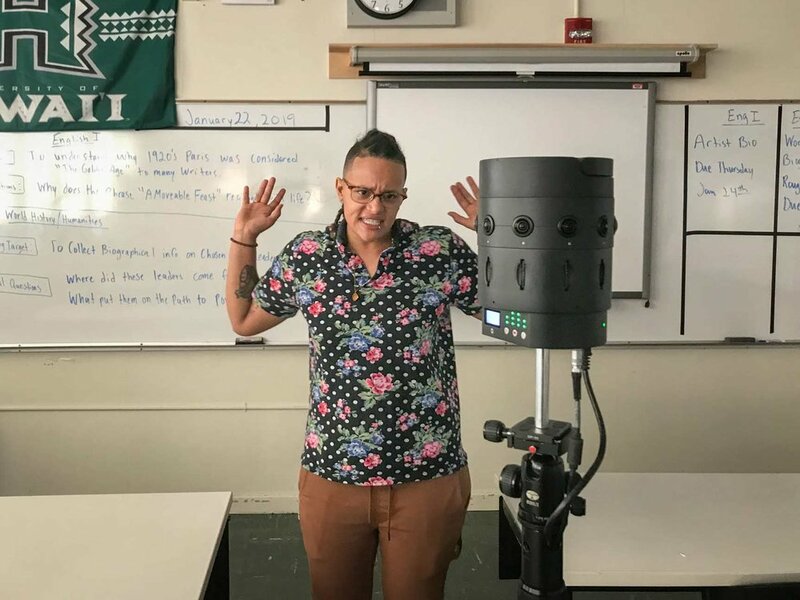 Jamie had sent me shaky Youtube video of a slam poem performed by CeCe Jordan, a woman who had taught history at that same Oakland high school. Her poem about how black teens who have fallen to the lowest level of the public school system can sit in circle together and access their own personal wisdom to heal their situation, affected me deeply. CeCe had just recited this poem at a screening of Circles in Oakland earlier in the week and it was obvious that this was a wisdom teacher experience that should be captured. 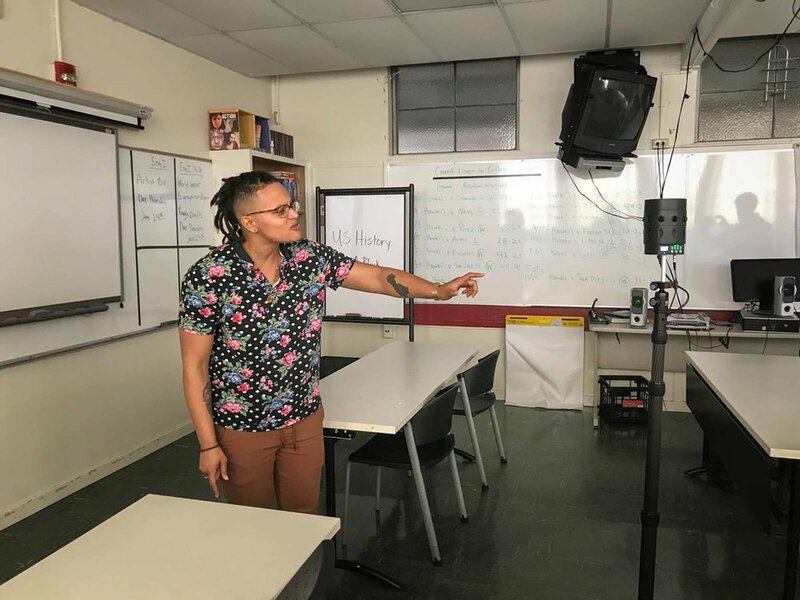 Jamie hooked me up with Cassidy, Cassidy called CeCe, and we went to Ralph Bunche High School this past Wednesday to capture her performance in the classroom. Here it is… please watch in a headset to have the unique experience that you are standing right next to CeCe as she spins this poem for you personally. CeCe’s delivery is fast (in true slam style) so to completely parse the poem and all of its meaning you should also read it.. the transcript is listed on the Wisdom Teachers VR Project page about the piece. The poem is written in screenplay format, with CeCe giving voice to ten different students as they come up with their own plan to create a restorative justice circle and heal their personal suffering which stems from being marginalized by the educational system. 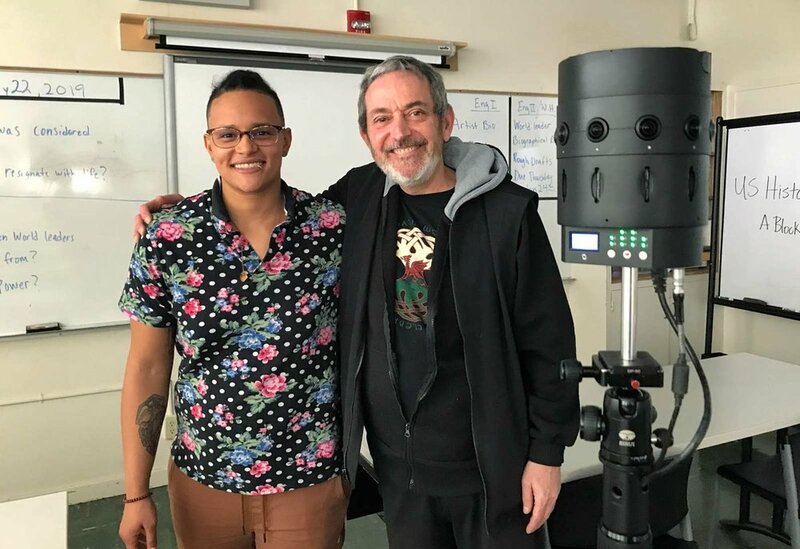 The first step in capturing this unforgettable performance was to show CeCe the pieces I made recently with Betty Soskin in the Oculus Go and she immediately got how, by connecting to the virtual viewer who embodies the space inside of the camera, she could create a thread that runs through time and space, diving directly into the viewer’s soul. If you have a headset, you can experience this for yourself. The biggest lesson learned from this project is to stay open to all potential sources of wisdom teachings. Although the project is primarily focussed on creating a legacy for elder teachers who won’t be with us much longer, there is plenty of room for capturing these kinds of amazingly inspiring experiences from people of all ages. Cassidy Friedman has worked tirelessly to get the message about restorative justice out there. Here he is along with the star of the Circles film, Eric Butler. We had coffee together before the session with CeCe and my eyes were opened to their commitment to the power of restorative justice… and I hope to do more in this realm in the future. In terms of technique, all I had to do was give CeCe basic instructions on how to work with the camera, to keep her focus on the connection she’s making with the virtual viewer. Once I had a lav mic on her I hit record and left the room. Postproduction was simple… a quick stitch in Mistika (because I love those stereo edge points), rig removal in MochaVR and finally spatializing the audio in Logic using AmbiPan/Head. The entire piece was finished and posted to the Wisdom Teachers VR Project website less than 24 hours after it was captured… a new record for me. CeCe connecting with the virtual viewer inside of the camera. Average distance to camera, 32” with hands as close as 18". Here are a couple more of CeCe’s poems. Her skill at spinning these makes it obvious why she finished in the top 5 at the National Poetry Slam competition.